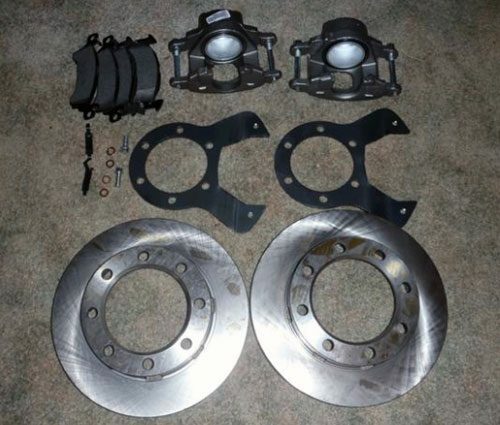 Upgrade the OE disc brakes on your 1990 to 1993 Dodge Dana 60 kingpin axle (with internal lockouts) with our disc brake upgrade kit! 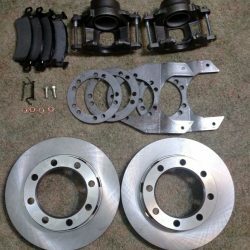 This Dana 60 axle brake upgrade kit is for 1990 to 1993 Dodge trucks with kingpin axles and internal lockouts. A new and improved design, our kit now works with all known aftermarket knuckles including Crane Knuckles. 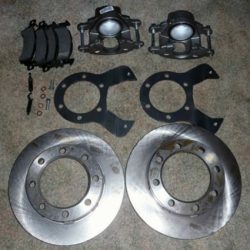 NOTE: This kit fits 1990-93 Dodge kingpin axles with internal lockouts. Internal lockouts are the same as you see on most Ford and Chevy axles. Older Dodge axles use external lockouts – this kit does not fit those axles, but I do have that kit also. Also, this kit’s bracket mounts outside the spindle like the original factory design. Please note that while mounting brackets are included in all our brake kits, our brackets are also sold individually here, and we can also provide longer braided stainless steel brake hoses here. To order this kit with the longer 24″ braided stainless, just order this kit with no hoses, and then add-on the 24″ hoses as a separate item.